While all the virtual reality attention has been focussed around the new standalone Oculus Go headset this week, the VR developers at Facebook are already planning future generations of the big-daddy Oculus Rift headset. The company used this week's F8 Developer Conference to show off a prototype called the Half Dome, the principles behind which will likely trickle down into whatever the Oculus Rift 2 eventually proves to be. Half Dome, though externally looking very similar to the existing Oculus Rift, makes use of a very different internal lens system – one in which its lenses move mechanically to move closer and further away from a user's eyes dependant on the focus point an app is aiming to deliver. 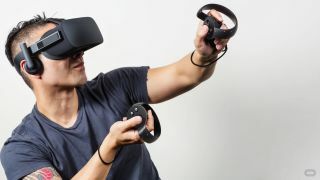 Oculus's Maria Fernandez Guajardo, head of product management, described this as a "varifocal" display, but fell short of detailing whether or not the moving lenses would be governed by an eye-tracking camera or just software calculations. A demo video showed a tester holding a virtual item, raising it to her face and then seeing it come into greater clarity as it drew closer. Fine details became clearer, with the legibility of text particularly improved. In addition, the company revealed that the lenses would vastly improve field-of-view for a wearer, increasing from the current Rift's 110-degree view to 140-degrees. Cast your mind back to F8 2016, and these details were laid out as a five year plan for the company's VR ambitions, so progress is already happening at a good pace. Next on the agenda? 4K-per-eye resolution screens.